"On Sunday June 13, 1971, the Aztecs, Chain, Daddy Cool, Wild Cherries, La De Da's, Healing Force and Lotus were the line-up for a concert at the Melbourne Town Hall. Taking advantage of such a big occasion, the Aztecs decided to record their set for a live LP and TV special -- complete with a 30 foot inflatable starfish type creature that deflated too early and had to be held up by various roadies and friends so the band could keep playing! 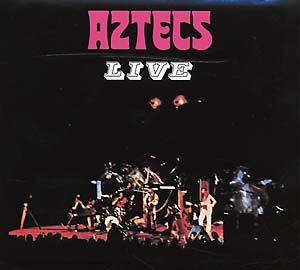 The resultant LP Aztecs Live (also know as Live At Melbourne Town Hall) captures the band on the brink of becoming the biggest band in Australia, and a rare document of the Thorpe, Matthews, Morgan and Wheeler line-up. Our deluxe reissue of this album is augmented by the 6 A & B sides of the Aztecs' singles for the Havoc label -- including 'The Dawn Song' and the monster hit (and all-time Aussie classic ) 'Most People I Know Think That I'm Crazy.' Plus, as an additional bonus, a never before available track: 'Long Live Rock 'N Roll,' live from the Rosebud Outdoor Festival in 1972. The CD is packaged in a 6 panel digipak, digitally remastered by Gil Matthews, with liner notes by Ted Lethborg. The 24-page booklet is full of great quotes and many rare images from the Live Aztecs TV special."